The fourth-century before Christ ruined city and monumental area of Ostia antica is the old Harbour of the Romans. Ostia [Ostium = Foce = Mouth of the river] is Latin for "mouth", the mouth of the Tiber. Actually the ancient Roman city of Ostia was situated at the mouth of the river Tiber, some 30 kilometers to the west of Rome. The archeological excavations undertaken at the beginning of the XIX century have brought the ancient city back to the surface, a witness to 900 years of Roman civilization. The best way to reach Ostia from Rome is by coaching a bus because it is only a further 5 km away. You will find excavated ruins accessible from 9 am - 7 pm and during summer classic plays are staged on the Roman theatre. Ticket Prices: € 4,00 full price – reduced price € € 2,00, closed Mondays. Follow the sea road to Imperial Rome's historic port at Ostia on a half-day morning tour. It takes only 30 minutes to reach Ostia Antica, at the mouth of the Tiber river, and you'll have plenty of time to explore the wonderfully preserved ruins. The ruins are convenient, compact and shady, and provide a tantalizing glimpse into daily life in ancient Rome. 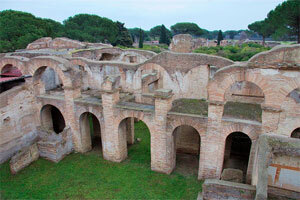 Escape to Ostia Antica and see why experts are calling it "The Better Pompeii". 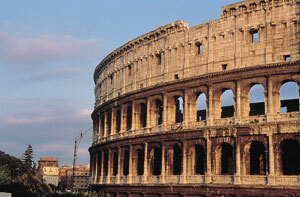 It is just a step away from Rome and you'll travel in a personalized small group with maximum 25 people! The perfect half day trip from Rome for those seeking to learn more about ancient Roman ruins but do not have time to travel to Pompeii. More ancient ruins can be found at Cerveteri, 44 kilometers away from Rome and built on a hill where the Etruscan town of Caere once stood. 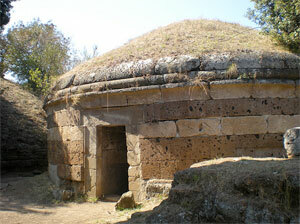 Its main attraction is the Etruscan necropolis about 2 kilometers out of town (open from 9 am - 6 pm, closed Mondays). The many tombs here are amazing for their interior decorations, from mythological wall paintings to "the Tomb of Reliefs", which is an immaculate replica of an Etruscan home carved entirely out of stone. To go to Cerveteri take a train from the Termini Station to the seaside town of Ladispoli, then catch a bus for Cerveteri itself or get a bus direct from Rome, on Via Lepanto. The whole journey takes approximately one hour. Tour the medieval villages outside Rome on an afternoon excursion to the Castelli Romani region. You'll take a relaxing drive through the beautiful countryside surrounding the busy capital, see views of the Pope's summer residence of Castelgandolfo and enjoy a wine tasting at famous Frascati. Nineteen miles east of Rome You will find the sixteenth-century Renaissance Cardinals' Palace, "Villa D'Este" at Tivoli. The Gardens with their 500 wonderful fountains, nymphs, grottoes, plays of water, and music, are the main attraction here. Villa D'Este can be reached by train: Roma-Pescara Line, Tivoli Station or by bus: Bus Lines Cotral Roma-Tivoli (station in Rome: metro stop Ponte Mammolo; bus station in Tivoli: Largo Nazioni Unite). Opening 8.30 – closed one hour before sunset. The ticket office closes one hour before the closing of the monument. The hydraulic organ of the Organ Fountain is active daily according to the following schedule: 10.30 - 12.30 - 14.30 - 16.30 - 18.30. The Fontana della Civetta functions at the following times: 10.00 - 12.00 - 14.00 - 16.00 - 18.00. Ticket Prices: (with the exception of one off events, exhibitions or other cases...) € 6.50 full price – reduced price € 3.25. Explore Italy's rich history at Emperor Hadrian's Villa and the remarkable Villa d'Este garden on a half-day tour from Rome. You'll take a relaxing four-hour excursion to Tivoli and travel through the beautiful countryside surrounding the busy capital. The two major highlights of Tivoli are visited on this full day private tour. First you will visit Hadrian's Villa, a beautiful tribute to the memory of the Emperor's lover. Next you visit Villa d'Este, built for Cardinal Ippolito d'Este, Lucrezia Borgia's son. This is a beautiful and relaxing day to escape the hustle and bustle of Rome. 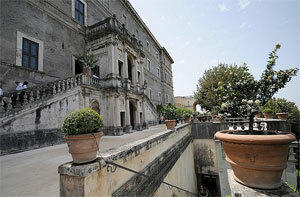 Take this special excursion to receive a Papal Blessing at Castelgandolfo in the summer months only. Availability is limited, so don't miss the opportunity to leave the busy Italian capital to spend time with the Pope at his summer residence at Castelgandolfo.